Provision is made for public comment (a 60 day period – commentary must be submitted by 14 November 2014). If you would like a copy of the gazette, please advise and we’ll send. Also, anyone wishing to make a submission/comment, you are welcome to send to us and we will forward to our industry body, ABVA. – the amended Scorecard for Qualifying Small Enterprises (QSE’s). – the amended Sector Codes. Other matters addressed in the gazette are procedural or very uncommon. The principles and framework for the new QSE Scorecard are the same as apply to Generic enterprises, as gazetted in October last year. There is no provision for a period of time to allow for enterprises to make the necessary adjustments in response to the requirements of this new QSE Scorecard. It is hoped that the Dti will a provide for such a transitional period beyond 30 April 2014 (the date after which it becomes mandatory to be measured against the amended Dti Generic Scorecard), so that companies can then start meaningfully addressing these new requirements, some of which are onerous and necessarily must be planned and budgeted for. The annual ‘total revenue’ to qualify as a QSE is ‘between’ R10 million and R50 million per annum. Note, the gazette says (with reference to fronting) “if its qualification does not result from circumvention of the codes”, presumably referring to activities such as dissecting businesses so that the separate parts have revenues below the upper threshold limits for QSE’s and EME’s. Note – based on the increase in the thresholds, even if the score remains the same, Measured Entities (ME’s) will see a significant drop in the rating level obtained. For example: if a score of 65 points is obtained on the current Codes, this equates to a Level 4 rating – meaning your clients can take 100% of spend with you towards calculating their preferential procurement score. Under the amended/new thresholds, obtaining 65 points would result in a Level 7 rating – ie, only 50% of spend can be taken. – removing the bonus points increases will the difficulty of obtaining sufficient points to reach higher threshold levels. A QSE will now have to comply with Ownership as a compulsory* element, and can elect either Skills Development or Enterprise Supplier Development. The significance of this is that these three priority elements have a 40% sub-minimum requirement for points obtained (termed the ‘Subminimum Principle’), and if a company scores less than 40% of the target, although whatever points scored will be recognised, the overall rating obtained will be dropped by one level. For example: if actual overall outcome is a Level 4, the rating recorded on the Scorecard is (drops to) a Level 5.
b) if a sub-minimum of 40% is not obtained for either Skills Development (an overall 10 out of 25 points), or for each of the sub-categories in Enterprise & Supplier Development (totaling 12 out of 30 points). This element measures the extent to which enterprises buy goods and services from Empowering Suppliers (see below) with high B-BBEE recognition levels. It focuses on the extent to which they undertake supplier development and enterprise development initiatives intended to assist and accelerate the growth and sustainability of micro/small black enterprises. As such, the contributions made target EME’s and QSE’s, which are at least 51% Black owned or at least 30% Black women owned. Note: a sub-minimum score of 40% is required in each of the three categories. at least 25% of cost of sales excluding labour cost and depreciation must be procured from local producers or local suppliers in SA, for service industry labour cost are included but capped to 15%. job creation- 50% of jobs created are for Black people provided that the number of Black employees since the immediate prior verified B-BBEE Measurement is maintained. at least 25% transformation of raw material / beneficiation which include local, manufacturing, production and /or assembly, and/or packaging. skills transfer- at least spend 12 days per annum productively deployed in assisting Black EME and QSEs beneficiaries to increase their operation and financial capacity. 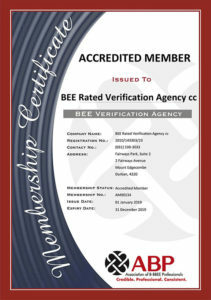 – A 100% Black owned QSE automatically qualifies for a Level One rating. – A QSE that is at least 51% Black Owned qualifies for Level Two rating. – As per our last newsletter, those economic sectors with their own B-BBEE Codes and Scorecards are required to be aligned with the amended Dti Codes by 30 April 2015. Unfortunately, amended Codes for these different sectors (Construction, Transport, Tourism, Forestry, ICT, etc. ), have not been published/gazetted for comment as yet. The sector code related matters addressed in this Gazette only deal with procedural requirements to be taken by the Sector Councils to align with the Dti Codes. However, we believe that, in the same way that the Dti’s QSE Scorecard has replicated the Dti Generic Scorecard’s principles and framework (recognition levels, number of elements, priority elements, sub-minimum thresholds, discounting principle, etc. ), so the various Sector Codes will closely follow suit. We understand that each of the concerned sectors is currently busy with the exercise of amending their Codes to align with the Dti generic Codes, in order to meet the 30 April 2015 deadline. We will provide updates as and when we receive more information. Please contact us should you require any further clarity or assistance.